The much anticipated Porsche Macan compact SUV, the fifth model line for Porsche, was ceremoniously unveiled to a massive international audience during a press conference at the L.A. Convention Center in Petree Hall today. The Macan was the brightest but not the only highlight that Porsche brought to Los Angeles. The new 911 Turbo Cabriolet, 911 Turbo S Cabriolet, the Panamera Turbo S and Panamera Turbo S Executive, and the 918 Spyder also took a bow to the many journalists either as world premieres or North American debuts. With the Macan, which comes in two models, Porsche has unmistakably created the first sports car in the fast-growing compact SUV segment. 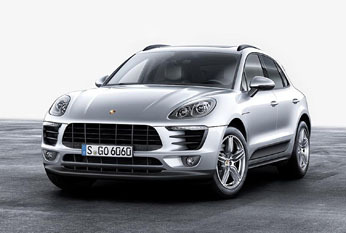 The Macan S, powered by a 3.0-liter twin-turbo V6 engine with 340 hp, can accelerate from zero to 60 mph in 5.0 seconds. The Macan Turbo’s 3.6-liter twin-turbo V6 produces 400 hp and makes the car sprint from zero to 60 mph in 4.4 seconds. “The Macan possesses all the qualities that have made compact SUVs so popular around the world: a practical, flexible interior; the visibility and sense of security that comes with extra ride height; and the ability to traverse rough roads with ease,” said Matthias Mueller, President of the Executive Board of Porsche AG. “The Macan’s agility, grip and steering precision are easily the best in class – and the 400-horsepower Macan Turbo is certainly the most powerful in its segment,” he added.